In 2000 we screwed up our courage, covered our eyes, and leapt into the cruising life. We disposed of our belongings and moved into Callipygia, a Tayana 37′ cutter-rigged sailboat. 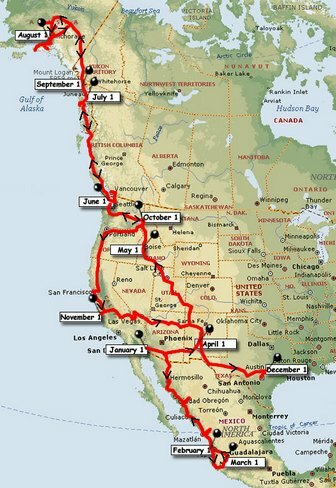 In 2004, after 7,500 miles cruising to eighteen countries, we swallowed the hook and took up RV’ing. 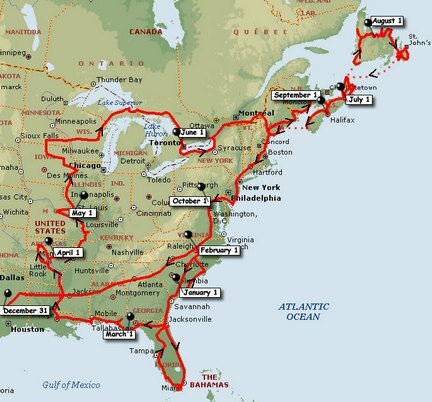 In the next 4 years we travelled over 50,000 miles covering much of the US, Canada, and Mexico. We began our sixties as full-time working stiffs. We cleared the hump of life and saw retirement age approaching; with it, the grave came inching into view. Time was flying. In 2000 we screwed up our courage, covered our eyes, and leapt into the cruising life. 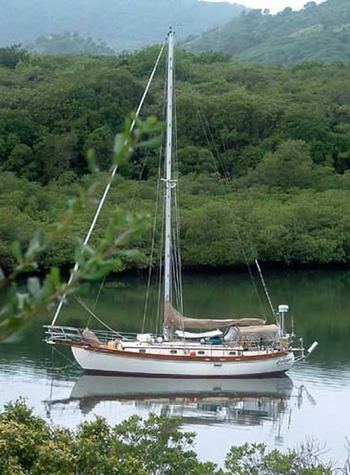 We disposed of most of our belongings and bought Callipygia, a Tayana 37′ cutter-rigged sailboat. 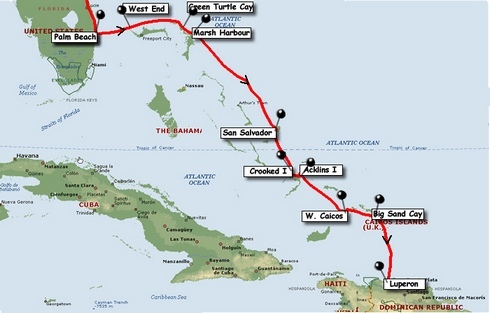 During the next four years, after spending some months learning the boat and doing upgrades, we moved aboard and cruised to eighteen Caribbean and West Atlantic countries – travelling over 7,500 nautical miles. But then, as we neared the end of our sixties, we began to feel our years and miss our families. So in the summer of 2004 we “swallowed the hook” and took up land cruising in a 24′ RV named Clementine. As we cruised the seas and land together we found time to think about what was happening worldwide. Our awareness of different cultures grew. It became ever clearer that the US’ and humanity’s current paths are unsustainable. In our final years we want deeply to contribute to the more benign evolution of our species, and to join hands with all who care about the future of our planet and its inhabitants. We bought Callipygia in October, 2000, then spent the first several months getting her, and ourselves, ready to go cruising. Our shakedown cruise took us to Camden, ME and on our return we moved aboard and headed south. Our route is shown in red. Pushpins and place names show (most of) our stops. During 2001, Callipygia took us 2,634 nautical miles on 34 days in transit. We started the year in Florida before crossing the Gulf Stream to the Bahamas. After gaining some more cruising experience, we worked our way south to the Dominican Republic. Our route is shown in red. Pushpins and place names show (most of) our stops. 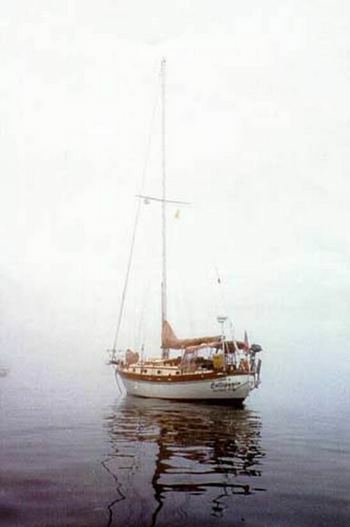 During 2002, Callipygia took us 1,333 nautical miles on 31 days in transit. We started the year in the Dominican Republic and worked our way along Puerto Rico, through the Virgin Islands and down the Caribbean to Trinidad where we hauled out for Hurricane season. 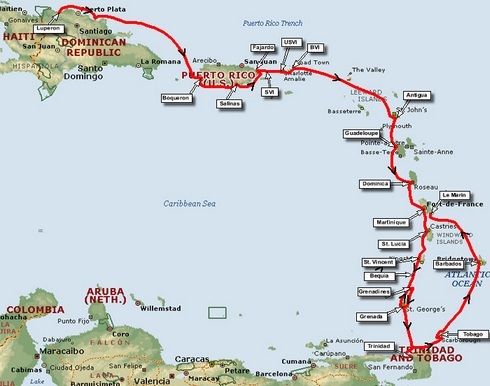 We ended the year back in Martinique.Our route is shown in red. Pushpins and place names show (most of) our stops. During 2003, Callipygia took us 1,883 nautical miles on 47 days in transit. We started the year in Martinique and worked our way up the island chain to St. Martin. 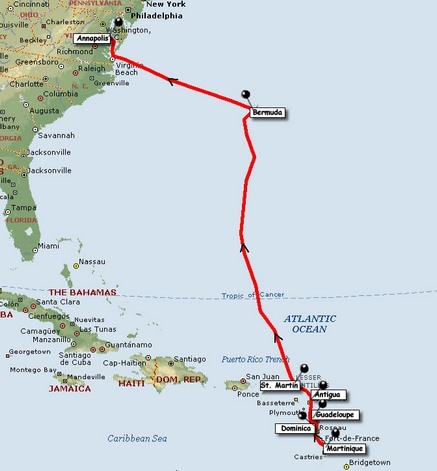 From there we made a 10-day crossing to Bermuda. At that point, after much soul-searching, we decided to “swallow the hook” and switch to land cruising. Our route is shown in red. Pushpins and place names show (most of) our stops. During the 1ast half of 2004, Callipygia took us 1,699 nautical miles on 20 days in transit. 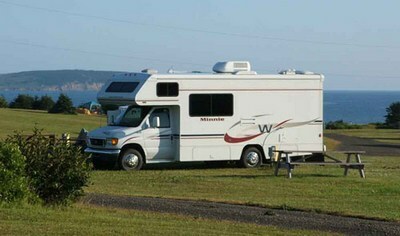 We closed on the purchase of Clemmie (as we named our new RV) on July 17. We spent a couple of days moving in and then took off on our new adventure. Our route is shown in red. Pushpins and dates indicate where we were during the year. During the 2nd half of 2004, Clemmie took us 5,229 miles on 27 travel days. 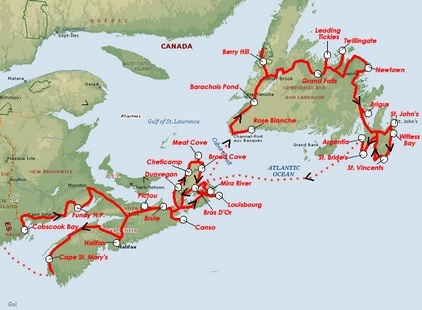 The map shows our route from the start just across the Maine border through New Brunswick and Nova Scotia, round Newfoundland, and back through Nova Scotia to Maine. Our route is marked in red; the dotted lines are ferry trips. The places we camped are circled in white with place names beside them. We travelled 3,642 miles on this 10-week tour. That’s not counting ferry miles. We started 2005 with Clemmie in storage in Charleston, SC. In early January we left to make a quick visit to dear ones in Raleigh, NC, then toured around Florida, the Everglades, and the Gulf Coast before heading up the Mississipi River. Later, we turned east to Maine and spent the summer in Atlantic Canada. The fall found us driving south and west to end the year in Austin, TX. Our route is shown in red. Pushpins and dates indicate where we were during the year. In 2005, Clemmie took us 15,738 miles during 101 days travelling on the road. We welcomed the New Year in Austin, Texas and followed the Gulf Coast and Rio Grand to Big Bend National Park. Then back to Maine for Laurie’s final weeks. Still grieving, we flew to the UK for 7 weeks. On return we drove across Canada to the Rockies and explored the Pacific Northwest and Oregon Coast. In early winter we drove through California arriving in Yuma, AZ, on New Year’s Eve. Our route is shown in red. Pushpins and dates indicate where we were during the year. 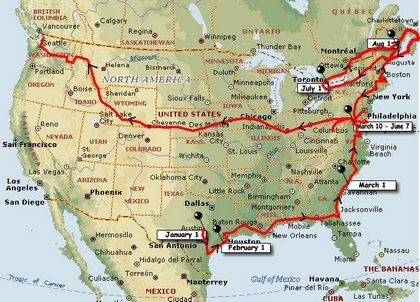 In 2006, Clemmie took us 13,392 miles during 81 days on the road. 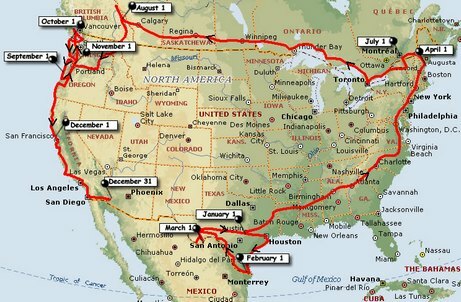 The map shows our travels unfolding during 2007. Our route is shown in red. Our location at the beginning of each month is marked with a push pin and date. We started the year in Yuma, Arizona, en route to a 2-month birding trip down Mexico’s west coast. On our return, we ambled north to the Olympic Peninsula and ferried our way up the Inside Passage to spend thesummer in Alaska. We finished the year in Texas for the winter months. The map shows our travels unfolding during 2008. Our route is shown in red. Our location at the beginning of each month is marked with a push pin and date. We started the year in Austin, TX, planning to spend the cold months on the Gulf Coast. We shortcircuited that when we decided to make 2008 our final year as full-time travellers. After spring in the DC area we toured the northeast and Nova Scotia to visit dear ones during the summer. In August we crossed the country to Bellingham, WA, to catch the ferry to Juneau and settle down in our house there. This Log is the journal of Callipygia’s travels since her purchase in October, 2000, through the end of 2001. It documents our experience as beginning live-aboard cruisers. The map to the left shows our cruising route. We had our new boat laid up for maintenance and improvement projects at Herrington Harbor in Deale, Maryland, for the first six months. This gave us time to do some work ourselves and become familiar with the complexities of the boat’s inner workings befor we took off on our shakedown cruise to Maine, and then working our way south to Florida. When we purchased her in October, 2000, Callipygia was on the hard at Bert Jabins Yacht Yard in Annapolis. After closing, Bill hired Jack Roden in early November to help him through the launch and delivery to Shipwright Marina, in Deale, where we had rented a slip. We held a boat-naming ceremony on November 21st (day after Bill’s 65th Birthday) designed in the Lakota Indian tradition by friends Al and Vicki Adams. In early December we had Callipygia winterized and then moved her across the creek to Herrington Harbor North in late December to be hauled. We developed a long list of to dos to make her ready for the spring and summer sailing season. Below is a condensed list of the major improvements and repairs that we made since then–going, of course, way over our budget. We did what we could ourselves, and hired help when the work (most of it) was beyond our then competence. Of great assistance was Rich Wilder (NP2C), former owner, who went well beyond what could be expected in helping us understand how this lovely boat worked and the ins and outs of her (to us) very complicated systems. The transition from Tempus Fudgeit, Pat’s Pearson 27, to Callipygia has been like transitioning from a bicycle to a 16-wheeler. Since Bill retired last November, as of his 65th birthday, he has spent almost full time on this project. There has been a huge amount to learn and do – but it’s likely just the beginning.